* All gradients with in the station limit on either side upto 2.5 Kms. * Kilometer and class of level crossing gate within the station limits, whether interlocked or not. * Up & Dn direction, Name of important junction and immediate station on either side. * Location of signals, with reference to point and level crossing gate. * Marking of signals, points and level crossing gates. * Type of Block working with adjacent station and location of Block instrument. * Restriction on dead end sidings. * Details of Axle counters / Track circuits. * Holding capacity of all running lines and sidings. * crossing with in and out of station section. * Reference to approved engineering plan on which the signalling plan is based. * CRS‟s dispensation for deviation from G&SR / SEM, if any. * Aspect sequence chart for CLS. * Name of the station, Standard of station. * Class of station, Centre line with kilometers, North point. * Names of the stations with distance on either end of the station. * Panel position / SM‟s control, with spare knobs / slides. A typical signaling plan can be seen. 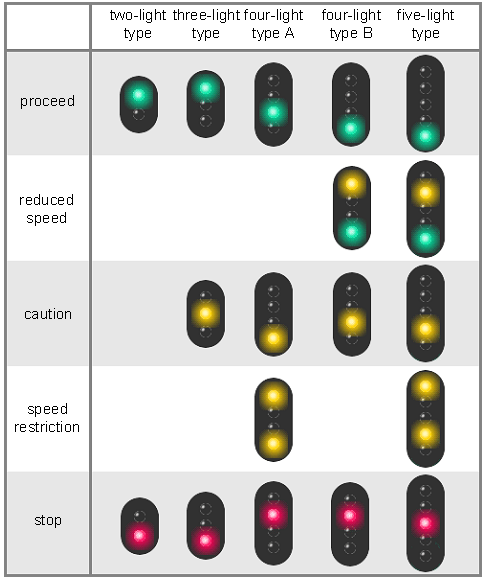 All signals and points are given a number, as per certain standard conventions. First the civil Engineers who lay the track structure on the ground prepare a plan called permanent way plan or Engineering scale plan. Based on this plan signaling plan is made by signal engineers for catering to the train operation requirements. One of the unique features of Railways working is the level crossing gate where a road and the rail track cross each other at the same level. The level crossing gates are of following types. 1. Manned and interlocked with signals. 2. Manned and not interlocked with signals. When the standards of Interlocking are discussed. Interlocking of level crossings with signal will also be covered. If the interlocked gate is within the station limits, the station signals will protect the movement of trains over the gate. If the interlocked gate is in the block section, independent signals will be provided on either side of the gate and will be controlled by the Railway. Staff manning the gate.